It is difficult to describe the experience of the Tankwa Karoo other than saying that the silence and vastness of the environment impacted on me in a way that I could only have imagined. My initial concept to create an ephemeral sound-drawing from soil collected from the Tankwa river bed remained unchanged, but the sounds I envisaged capturing changed during the time spent at Tankwa Artscape. The natural soundscapes were minimal due to the silence that rests within the desolate landscape, prompting me to include sounds made by some ancient musical instruments which were played by a collaborating artist, Quentin Dibley Green. Creating Architecture of Sound in an abandoned reservoir initiated a new concept for a possible future sound piece. The Tankwa experience was abundant: Sharing,collaborating, creating and relating. My art manifested, miraculously, meditatively connecting me intimately to the landscape and providing a portal for others to enjoy. The labyrinth provides an easy/fun/meditative way to link the human experience to the majesty and intricacy of the landscape. The two eggs… hidden in the manner of the local kiwiets, will be a gift for the observant visitor, a combination of creativity and symbolism inspired by the rocks of the Tankwa. 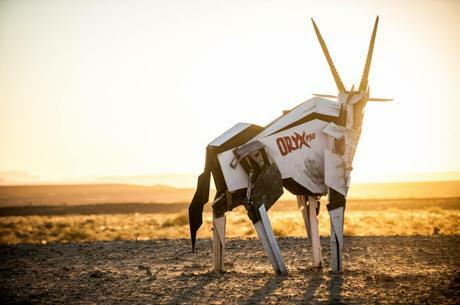 The Oryx 850 was born of a futuristic Mad Max/ Starwars inspiration, one where machine and animal are unified, at the expense of habitat loss, technology is our saviour. The Tankwa Karoo gave my friend, Johann and I, a beautiful sighting of three of the actual animals from the koppie on our previous visit. Seeing those sleek powerful and graceful creatures so at home in the harsh stones was inspiring. This rogue sculpture has abandoned its rider and is living in the backwaters of an ancient question: When resources are few how will we survive? The experience at Tankwa Artscape was an unexpected fold of time and space. In digging into the earth and walking over the landscape, I felt a sense of immediate transience and of the temporary nature of being. As Tula and I walked, our shadows growing longer, I was aware of the incomprehensible nature of time - as layered, long and fleeting. Our imprint on the land a small whisper. And yet the smallest thing in the landscape was monumental - every stone and twig seeming to mark the silent history of the place and its unfolding. Our camp, full of delicate sounds, music, conversation, cooking and the occasional rumbling of the generator, was a place of wonderful sustenance. I am deeply grateful for the experience. Any human form for me is a self reflection as a living being on a psychological and a spiritual level. I want to create a female figure as the female element plays such a big role in the circle of life. Nature also has this process of the circle of life, rebuilding itself and caring for itself. The Tankwa seems to be quite lifeless but this female quality of rebuilding itself is there and I want to make it visible as a moment of stillness and stability. Nature and the female figure as a symbol for nature form a single continuum. The Tankwa Artscape Artist Residency was an unbelievable opportunity to immerse ourselves in the magical landscape of the Tankwa Karoo. Getting to work alongside other artists who share a love for the natural environment, each bringing their own perspectives and experiences created a sharing and learning atmosphere. I think the most important thing we have learnt is consideration. Consideration of every detail and every consequence, which is vitally important when working in such an untouched and sensitive environment. The Skeleton Leaf of Change, directed by Kiara Watermeyer, is a land art installation built by a group of young female artists for Afrikaburn 2018. The notion of creating a safe space by embodying feminine energy had the project conceptualized, designed and built by women as a leaf reduced to its skeleton veined state which is symbolic here, in transformation of growth and change of the self and the environment. Therefore, this sculpture is an acknowledgment of the ancestral presence of the desert and a way to give thanks to this immense inheritance. The artwork is an ode to mother nature and the sacred land where the piece came to life. During AfrikaBurn the project was invited to remain as part of Tankwa Artscape as an example of nature art and eco building techniques. The folklore of this region often makes mention of shape-shifting characterisations typical of legends around the world. As a great fan of story-telling I love the flexibility that this affords and allowed for this to enter the narrative of my contribution. In preparation I cast the bronze head of a fox and cut some twisted tree trunks of the hard gum traditionally used as fence posts, before joining the other artists already at the site. As an artist who lives and works mostly alone I anticipated the social component to be of most value, and it was. It is so valuable to share creative (and destructive) responses to an expansive environment, and being reminded to walk softly as if a child careful of thorns. This regard for a shared dream space contributed toward the completion of my work in several spontaneous ways. The site of a river bed was settled upon through conversation with the host. The location is in a basin out of sight and where the soft soil is already being disturbed by the shifting winds. An existing fence post became the ‘target’ of my creature, being another man-made contribution with which to converse. Other artists were involved in holding the sculptural components up and various compositions tested and conversed about, and this simple act became a form of theatre in that dramatic landscape. Insights were shared with our hands in holes and knees upon the earth. And so it continued with various contributors coming and going, even the forgotten fence builder of old was having a hand in this by way of the lasting traces of his craft. For example my posts were sunk using the old method of wedging with stone instead of the contemporary method of using concrete, and so on and so forth. I loved all of this interaction and allowed it to feed the creature as it rose from the depths.